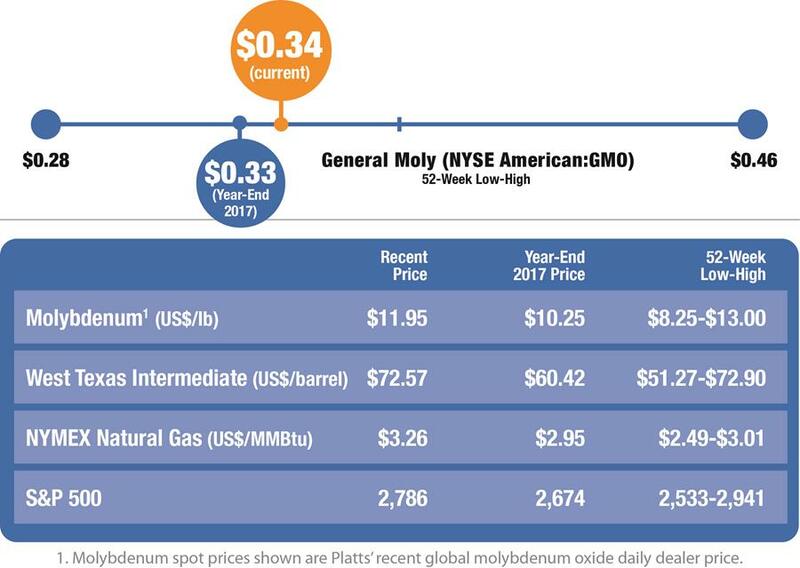 • Molybdenum price has been resilient, up 77% since year-end 2016. • Domestic stimulus policies in China and U.S.
expected to largely offset trade pressures. • Continuing but slowing global economic expansion. • Strong oil and gas prices and robust LNG market spur capital investments. Molybdenum (“moly”) has been a stellar performer in the sluggish raw material sector. During the third quarter, the broad raw material price index, Bloomberg Commodity Index trended lower, weighed down by a strong U.S. dollar and global trade tension. Metals were met with general investor pessimism with concern for the rising trade protectionism. In contrast to the price breakdown of its peers, the moly price rose 11% in the 3Q and 17% year-to-date, trading around $12/lb (Platts). Moly’s exceptional performance has allowed it to stand out alongside the few bright sparks of non-agricultural commodities, such as oil and gas. Increasing world stainless steel output and greater capital investment in the global oil and gas sector have buoyed moly in 2017 and 2018. 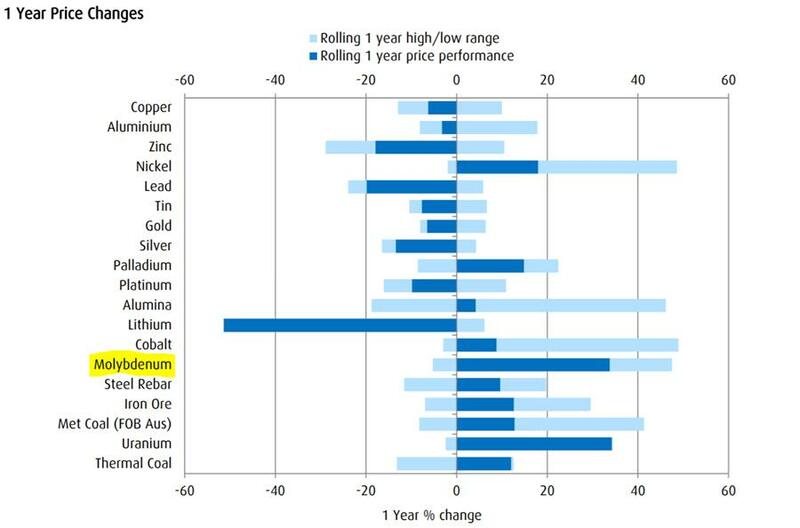 Within BMO Capital Market’s metals and mining universe (Figure 1 below), moly leads the pack in the past one year with a price increase of over 30%. – New stimulus policies in the largest economies. Steel production is the largest application of moly and consumes approximately 70% of all moly. Within steel making, specialty steels are the largest segment consuming 62% of all moly. The value-added specialty steels are made up of stainless steel (21% of total moly use), full alloy or engineering steel (20%), high-strength low-alloy (11%) and tool steel (10%). According to CPM Group, a commodities research and advisory firm in New York, which just published its new Molybdenum Quarterly report, stainless steel is a good indicator of moly consumption trends in other specialized steels as well. 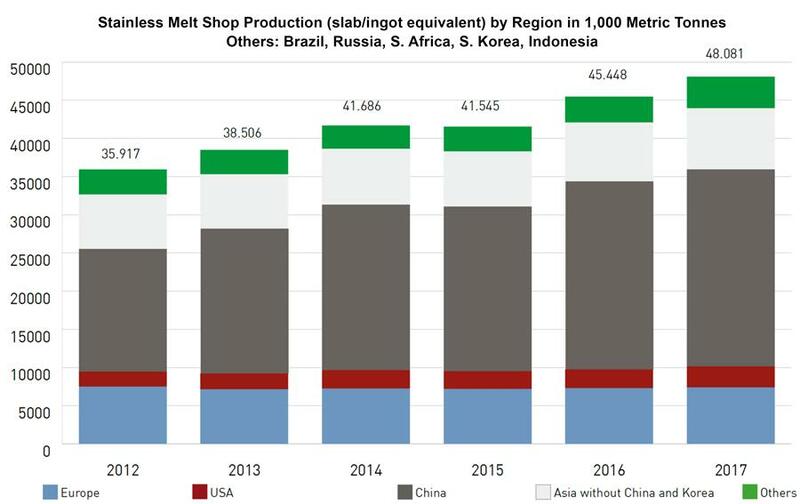 In 2017, world stainless steel production increased by 6% to 48.1 million metric tons (“mt”) over 2016 led by China’s output growth (5%) to dominate 54% of world stainless steelmaking, according to the International Stainless Steel Forum (“ISSF”). Notably, the United States stainless steel output rose by 11% to 2.8 mt in 2017 over 2016. Accelerating from 2017, the world stainless steel production in 1Q 2018 saw a dramatic 10% year-over-year increase and a 26% increase over 1Q 2016. 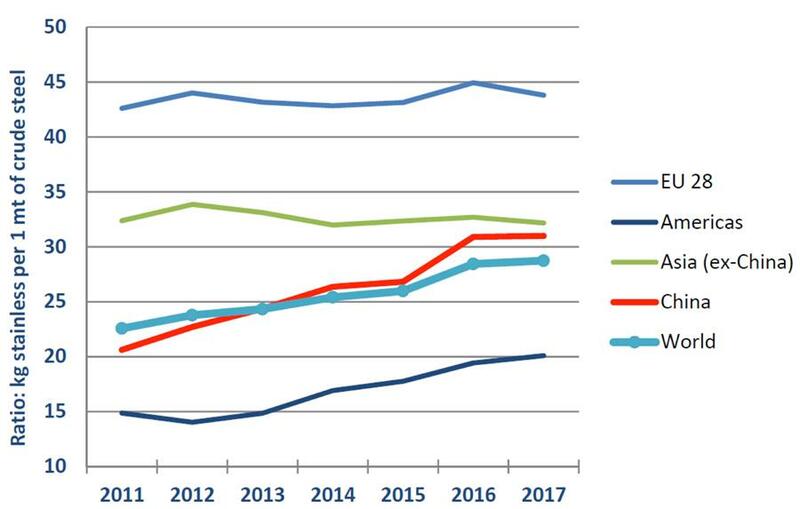 Highlighting the growth in global stainless steel, CPM noted the rise in the stainless ratio measuring the amount of stainless steel per metric ton of crude steel in Figure 3. 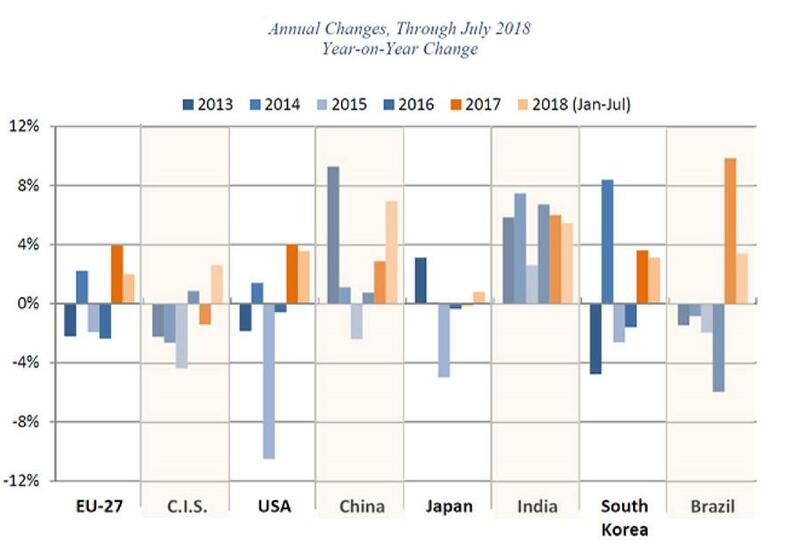 World crude steel production increased approximately 5% year-over-year (“YOY”)for the first eight months of 2018 over the first eight months of 2017, with the largest producer China reporting an approximately 6% increase, and the U.S. a 4.0% increase, over August 2017, according to the World Steel Association. 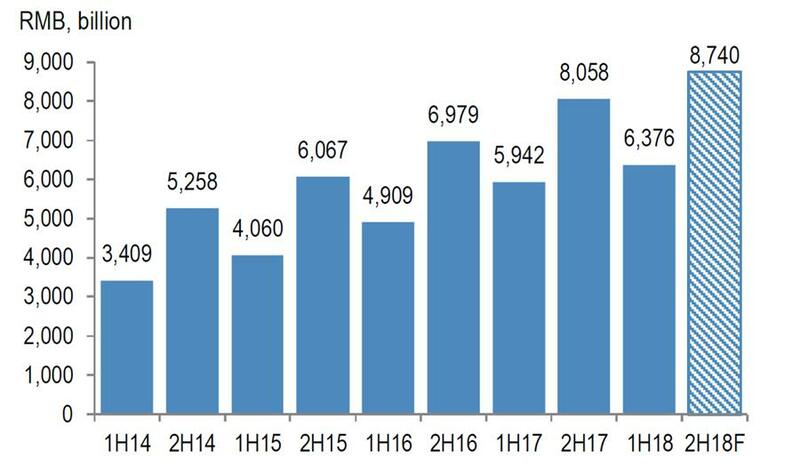 Global steel consumption increased 6.4% YOY in 2Q 2018, reported BMO Capital Markets. During 1H 2018, China’s apparent steel demand jumped 9.5% YOY, leading a global growth of 6.1% during this period. Dr. Copper may be signaling a slowing global expansion, but Dr. Steel is an indicator of the continued vitality of the global industrial output. The uncertainty of global trade wars undermines business confidence, which affects capital investments and consumer spending. That said, the negative effects need to be kept in perspective. Steel imports from China account for only 2% of all the U.S. steel imports, according to the U.S. Department of Commerce statistics. The overall direct effects of U.S. tariffs are estimated to reduce China’s growth by 0.2% and global expansion by 0.25%, according to J.P. Morgan’s Global Commodities Research. The sky is not falling. “By our estimates, if all Chinese appliance/white good exports to the U.S. were reduced to zero, all things (being) equal, only about 140 kmt of copper demand and 475 kmt of aluminum demand, representing around only 1% of total Chinese demand in each metal, would likely be impacted,” the J.P. Morgan report stated. For more background, please see the October 2017 Moly Bits about moly as a super alloy in specialty steels. Even before the recent export uncertainty, China’s economy in 2018 was expected to slow from its strong 2017 growth of 6.9% to 6.4% in 2018, according to World Bank data. However, in a carryover from 2017, China reported real GDP growth of 6.8% YOY in the 1H 2018, bolstered by a 6.7% increase in industrial output. In September 2018, the Caixin China General Manufacturing PMI cooled to the neutral mark of 50.0, a level last seen in May 2017, after 15 months of positive expansion. “Moreover, new export orders declined at the quickest rate since February 2016 amid a number of reports that the China-US trade war and subsequent tariffs had impacted foreign sales,” Caixin reported. Responding aggressively, China is stepping up its domestic policies to invest further in-country infrastructure, increase domestic consumption, and calibrate expansionary fiscal stimulus to ease its economic slowdown and reduced exports. China will still be importing industrial metals for its mega projects. Earlier this year, the People’s Bank of China reduced the reserve requirement for banks to facilitate repayment of the central bank’s medium-term lending facility. Remaining funds after extinguishing debt must be directed to making loans to small businesses. In July 2018, the Chinese government also implemented tax cuts to foster value-added manufacturing and services. BMO Capital Markets reported that provincial governments in China issued RMB 625 billion (US$90 billion) in special purpose bonds for infrastructure projects in September 2018, equal to the amount issued in January through August 2018. China is the world’s biggest consumer of metals and the world’s second largest economy after the U.S. Even with an economy running at neutral, Chinese demand is supportive of moly, copper, and a host of other metals. On the domestic front, the U.S. Purchasing Managers’ Index (PMI) increased to a four-month high in September 2018, according to the J.P. Morgan-IHS Markit Global Manufacturing PMI. The administration’s income tax cuts put more discretionary money back into Americans’ pockets and the corporate tax rate was reduced from 35% to 21%. It now seems that the administration’s proposed $1.5 trillion infrastructure legislative bills would be a 2019 story. These policies are designed to spur the U.S. economy and help offset retaliatory trade tariffs on U.S. goods. Turning to the big picture, global manufacturing has slowed in each of the past five months to an indexed value of 52.2 in September 2018. While the U.S. may be at the peak of the economic expansion, between mid and late phases of the business cycle, world economies are firmly in the late-stage business cycle where the general investor sentiment is more defensive, supportive of hard assets like industrial metals, including copper and moly. Source: Left: J.P. Morgan-IHS Markit. Right: Caixin. The exciting and potentially disruptive change in clean power generation is the upsurge in the liquid natural gas (LNG) market. China is now the second largest LNG importer after Japan and is expected to become the world’s largest importer of LNG by 2021, noted the J.P. Morgan’s Global LNG Analyzer report. China’s increased LNG consumption is driven by the coal-to-gas replacement under the government’s Blue Sky Campaign and its Five Year Plan. China’s natural gas demand is expected to show a 13% compounded annual growth rate (CAGR) over the next three years and 6% CAGR for 2020-2030, according to J.P. Morgan. 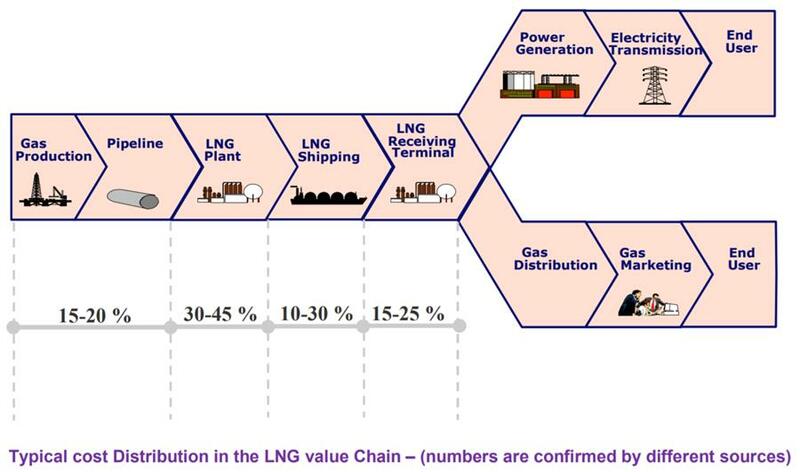 China is a leading example of the transformational global rise in investments in the LNG value chain (Figure 9) as a producer, importer, and end user. Source: Equinor (formerly Statoil) presentation. 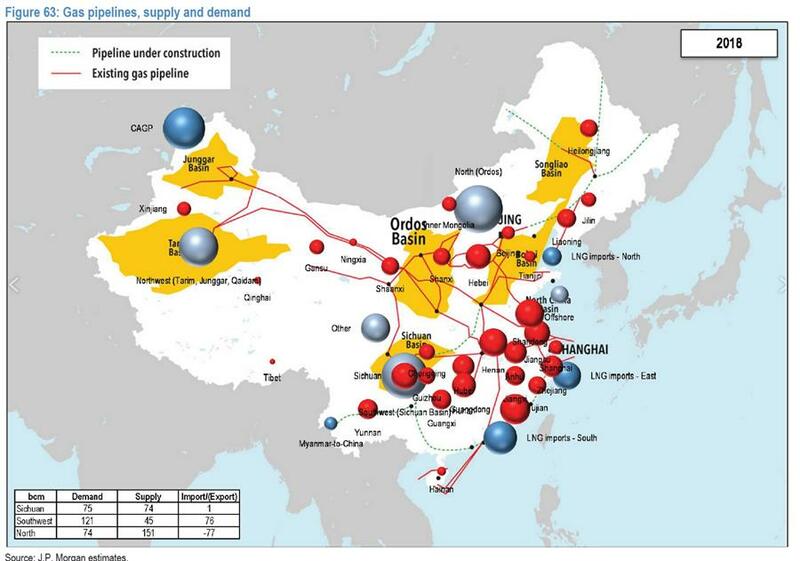 China depends on increasing LNG imports to fill its demand gap even as it is sharply increasing production of domestic natural gas from remote sources, which are located well in-land, away from its major cities, and requiring significant investment in a pipeline network (Figure 10). China’s regasification terminals are located on the south, east, and north coast. From pipes to storage facilities and LNG ships, all this new equipment requires moly-alloyed steel for its strength and anti-corrosion characteristics. Source: J.P. Morgan – Global LNG Analyzer, June 15, 2018. 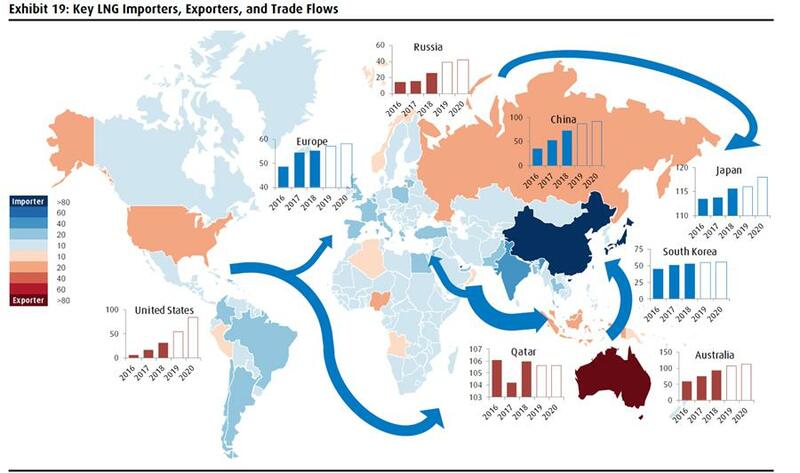 On a global scale, LNG trade flows are increasing as depicted by BMO Global Commodities Research (Figure 10). Source: Wood Mackenzie, IEA, BMO Capital Markets. Choropleth map represents 2018 imports/exports. Natural gas demand is projected by Shell to grow at a 2% annual average between 2018 and 2035, at twice the rate of overall global energy demand. LNG demand is expected to increase twice as fast as natural gas demand over the same period, according to Shell. The West Texas Intermediate oil price has traded over $65 per barrel since June 2018 and is now around $75 per barrel. Natural gas has rebounded above $3 per MMBtu since the end of September. At these price levels, alongside steady, predictable increases in Vienna Group pact of OPEC and non-OPEC producers and U.S. shale production to meet rising world energy demand, improved profit margins help bolster the oil and gas industry. Continued capital investment out of this industry, a key end-use market for moly-alloyed steels, fosters strong moly-alloyed steel consumption. Upstream (exploration and production) budgets for 2018 have increased 15% in North America, led by U.S. shale producers and 8% for the rest of the world, reported the Oil & Gas Journal, citing Barclay Research’s midyear global spending survey of the petroleum industry. 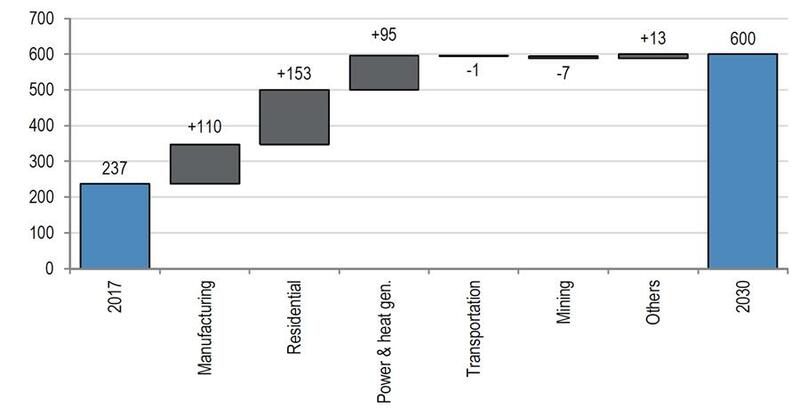 Mirroring the industry’s capex are the rig count charts below. All of this means more moly for steel in oil country tubular goods. For more information about the LNG and oil market, please peruse the May 2018 issue and first issue of Moly Bitsin July last year with our commentary about the rebounding oil and gas industry. Moly has maintained the bulk of its strength coming from its 2017 bull run, when moly was the second best price performer after cobalt. We believe the current lack of further upside was brought by trade tensions and a strong U.S. dollar, which is unlikely to climb much further. Moly is tough and resilient, as proven by its steady prices during a sluggish 3Q for metals and commodities. The factors that stymied the base metal prices also weighed on moly to keep itrange bound and were mostly temporary shocks that get built into business models and into market expectations. Trade tensions will still cause unease, but over time, the actual trade agreements will be better than fears of the unknown as the parties will be motivated to share benefits rather than inflict pain. Copper is already showing signs of recovery. Other metals such as moly are going to have their due. With our ongoing copper-silver-zinc exploration project, southeast of the moly deposit at the Mt. Hope site in Nevada, we have our rally caps on for a comeback for copper as well as higher moly prices. Bruce is the CEO and a Director of General Moly, the only pure-play Western-exchange listed molybdenum company. Having served in senior management at Newmont and Santa Fe Pacific Gold, assessing mining projects, directing technical services and managing the company’s finances among other responsibilities, Bruce is versatile. Currently, his favorite pastime is analyzing the copper-silver-zinc exploration program at the Mt. Hope site in Nevada and the occasional scratch game of golf. The information presented contains “forward-looking statements” within the meaning of Section 27A of the Securities Act of 1933, as amended, and Section 21E of the Securities Exchange Act of 1934, as amended, that are intended to be covered by the safe harbor created by such sections. Such forward-looking statements include, without limitation, (i) estimates of future molybdenum, other commodities and markets, as mentioned, prices, demand, supply and/or production; (ii) estimates of future capital expenditures; (iii) statements regarding cost structure, project economics, or competitive position, and (iv) statements related to potential market signals. Where the Company expresses or implies an expectation or belief as to future events or results, such expectation or belief is expressed in good faith and believed to have a reasonable basis. However, forward-looking statements are subject to risks, uncertainties and other factors, which could cause actual results to differ materially from future results expressed, projected or implied by such forward-looking statements. These risks and uncertainties include, but are not limited to, metals prices and production volatility, global economic conditions, currency fluctuations, increased production costs and variances in ore grade or recovery rates from those assumed in mining plans, exploration risks and results, political, operational and project development risks, adverse governmental regulation and judicial outcomes. For a more detailed discussion of such risks and other factors that could affect the Company, see the Company’s Annual Report on Form 10K, which is on file with the Securities and Exchange Commission, as well as the Company’s other SEC filings.